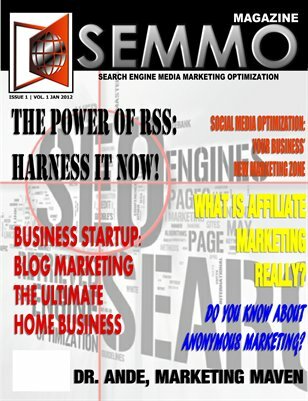 In this issue of SEMMO Magazine learn how to harness the power of RSS and how it can launch your search engine rankings into the stratosphere. Do you really know and understand affiliate marketing? If not, it's explained here. Learn about anonymous marketing and how it can help your business website traffic. Insider interview with Dr. Ande of Dr. Ande's Marketing Radio.